The re-creation of a historical alliance between Israel and Turkey against a “common enemy” would be seen as “bad news” across the Arab world, political analyst Chris Bambery told RT, adding that the move could also terribly damage Erdogan’s government. RT:If Ankara is involved in this and it is confirmed to be the case, what do you make of this certainly unlikely alliance between Turkey and Israel? Chris Bambery: Prior to Erdogan taking office a decade ago, Turkey and Israel were very close allies in the Middle East. Remember too that Turkey is a key NATO-frontline state with massive military aid given to it by the United States. So there’s a historical alliance between Israel and Turkey, fuelled by the dislike of many of the Arab states who both perceive as enemies. Under Erdogan, the military has been brought under some control in Turkey. I think the question must be twofold. Firstly, if Erdogan agreed to the use of a Turkish military base for the attack on Syria, this is going to fuel the discontent which it is already facing, with the demonstrations in Taksim Square and elsewhere. Given that Erdogan has gone out of his way to pose as being someone who supported Hamas in the Gaza Strip, has been a friend of the Palestinians, and has gone a long way back on a historic alliance with Israel, if Erdogan agreed to such an attack, it would do terrible damage for [those relationships]. RT:You are talking about tensions domestically, but what about the wider implications - with the Arab world, for example? How would they view Erdogan’s foreign policy on this? CB: Some countries in the Arab world - Saudi Arabia, Qatar and elsewhere - could not care who’s carrying out the attacks on the Assad regime. They would not care if Israel was doing it or anyone else because their agenda is so far up the ladder. But across the Arab world they would be seen as bad news...this is after all the fourth military attack on the Syrian territory that we know of and it is clear that the Israelis have carried out these attacks and if Turkish military have supported this attack in any way, it’s really going to open up a can of warms inside the region. 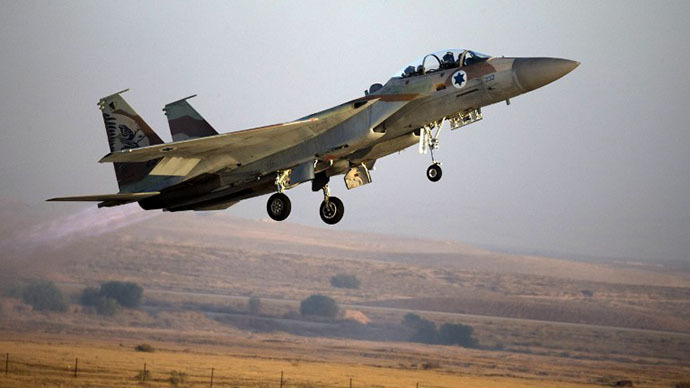 We know as well that Israel would like to use Turkey as a staging post for an attack on Iran. And if they are allowing the use of bases for an attack in Syria, will they use the same bases for an attack on Iran? And therefore there’s going to be a growing consternation across the region about possible coming back together again of some sort of alliance de facto between Turkey and Israel. RT:Apart from the threat from Iran, surely the immediate threat for Israel is weapons getting into the hands of Hezbollah? So if they did carry out those attacks, they are justified in self defense?